Over the years, patches of each quadrant have seen a slow, deliberate wave of redevelopment and revitalization wash over it. 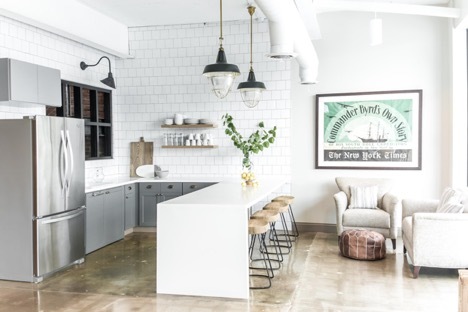 Factories have been replaced with luxury apartments and hotels, warehouses have been transformed into office buildings and craft breweries and old garages are getting second lives as art galleries, restaurants and grocery stores. These buildings are a natural fit for adaptive reuse with their large footprints and timeless architectural features and their redevelopment brings commerce and excitement to distressed areas. The biggest hurdle standing in the way of most of these revitalization efforts is potential environmental hazards left behind from years of industrial operation. 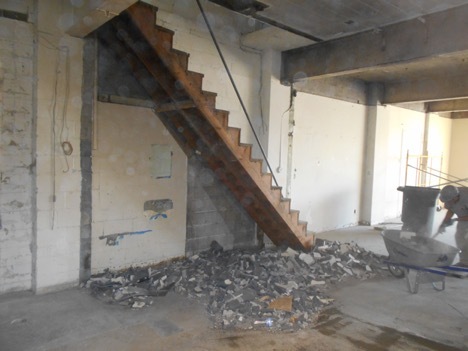 We manage environmental cleanups to revitalize these properties all the time. It’s what we do for our clients every day. But, in this particular case, it’s what we did for ourselves and for the surrounding North Meridian Neighborhood in Indianapolis. 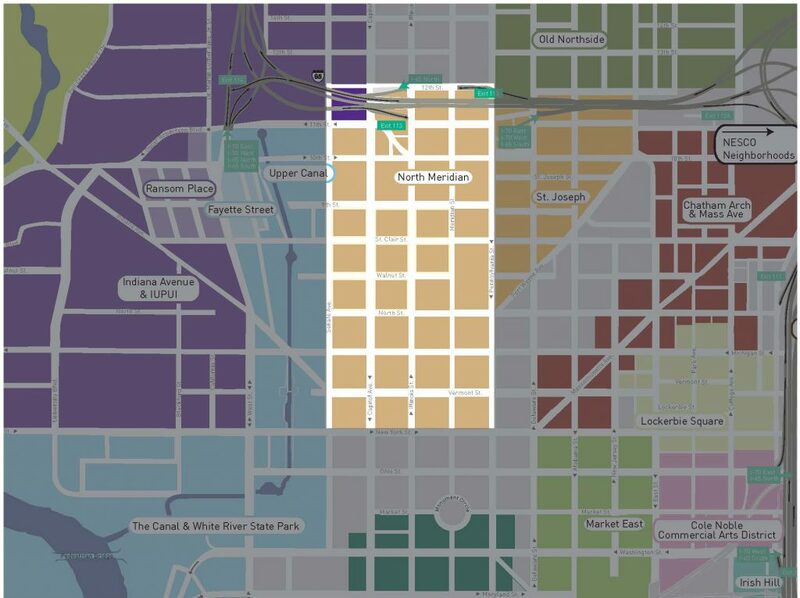 The North Meridian Neighborhood starts a block north of I-65 and runs south to New York Street, just two blocks north of Monument Circle. Courtesy: Downtown Indy. The 825 N. Capitol building operated as a transmission and automotive repair shop for decades and it sits on a stretch of Capitol Avenue just a few blocks north of the Indiana Statehouse, and right across the street from the famous Litho Press Building, now a luxury apartment complex. 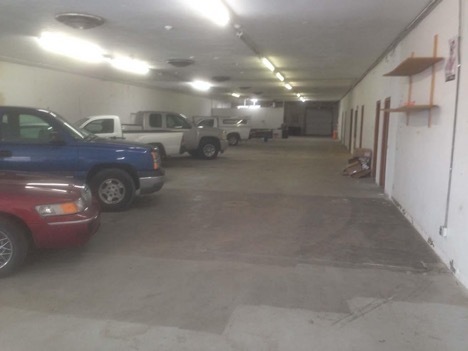 We originally purchased the building to store our equipment and company trucks. In a few short months, we found ourselves needing more space for our employees and we decided to use the space to build a new corporate headquarters. 825 N. Capitol Building in the fall of 2015. The unassuming cinder-block structure with a limestone façade was first constructed in the 1930s and because it operated as an auto repair shop, there were unexpected spills and releases of oils and solvents that found their way into the soil and groundwater. In addition to specific source contamination, groundwater beneath the building was also impacted from an unknown upgradient source. 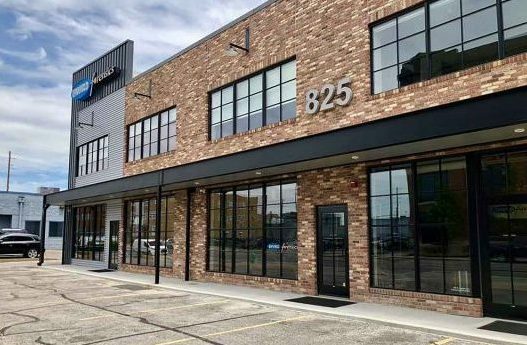 In 2000, EnviroForensics opened its Indianapolis office with three people in the old Stutz Auto Building, which is the “original” Indianapolis Brownfield Redevelopment, made up of nearly 100 offices and art studios of various size and configuration. By 2010, the office grew in size and was relocated to another old warehouse at 602 N. Capitol, above an active dry cleaner. 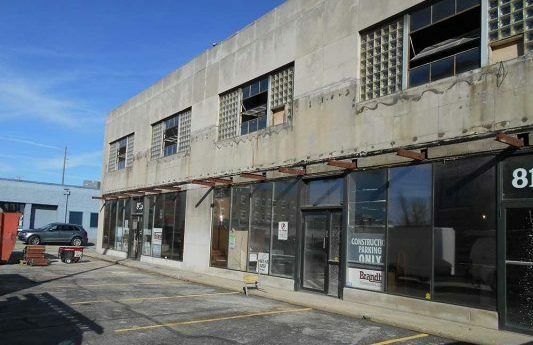 As the city downtown grew and parking became more scarce, management found an old automotive repair company at 825 N. Capitol Ave. to store its trucks and equipment. By 2016, EnviroForensics was bursting at the seams with staff jammed in the main office and several satellite offices located in nearby buildings. By this time, EnviroForensics had grown to over 60 people and it was pretty clear that they needed to consolidate the team and find a new office space. 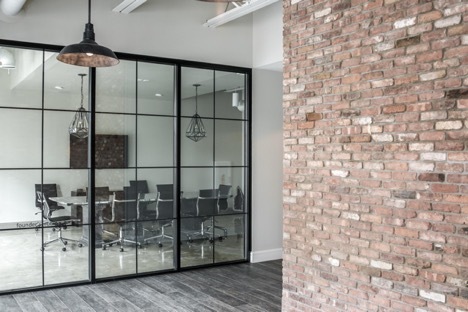 After assessing the financial implications of renting more office space and committing to a new lease, it became clear that the old automotive repair building could be remediated and refurbished as the corporate headquarters. The front facade’s tenuous connection to the rest of the structure. Eroding wires and weathered grout were the only things holding the front of the building together. 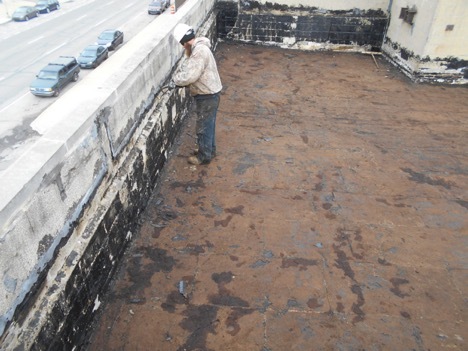 There were significant roof issues with the built-up tar and gravel that had been in place for decades. 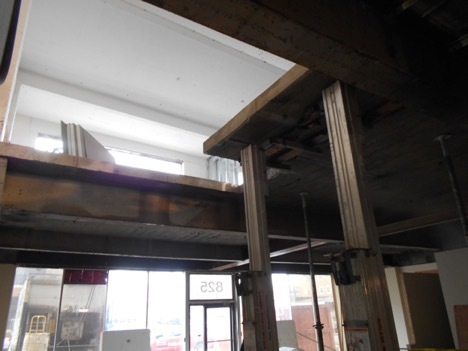 The building was still in a two-unit configuration from its days as a transmissions garage and a costume warehouse, and there wasn’t a safe way to travel between the two buildings without having to go outside. For us, dealing with the environmental issues was relatively painless, as we conducted the research of the historical operations and we were able to find the old Commercial General Liability (CGL) policies of the past owners and operators. 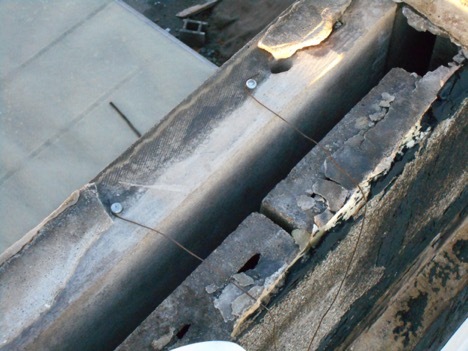 Because the soil and groundwater was contaminated, the Indiana Department of Environmental Management demanded that the site be fully assessed and understood and that soil vapors be routed from beneath the subsurface concrete slab to the roof line, so they did not build up and create an indoor health hazard. In tendering the insurance carriers of the former owners and operators, we were able to get the old insurance carriers to pay for all of the environmental and legal costs required to get the building squared away from an environmental standard and satisfy the banks concerns regarding the soil and groundwater contamination. To learn more about how CGL policies can work for you, read How Does It Work? Insurance Archeology and CGL Policies. The adjoining walls were torn down in four spots to connect the two buildings. 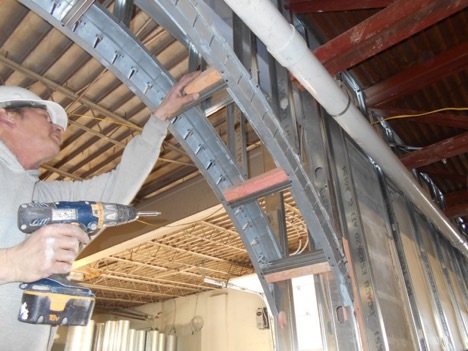 Once the walls were opened up, Brandt Construction secured them with load bearing archways. Brandt Construction also connected the first and second floors with a custom-built stairway. And they erected a new facade along a portion of the roof to create what is now our open common area for company-wide meetings and gatherings. 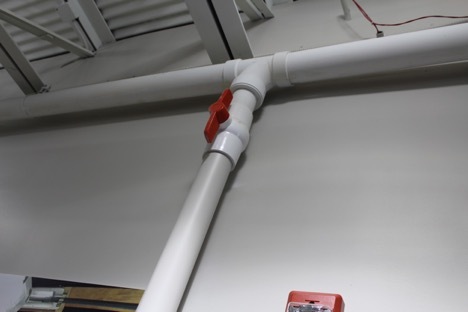 To ensure the safety of the indoor air for our team, Vapor Protection Services (VPS) installed a passive mitigation system. 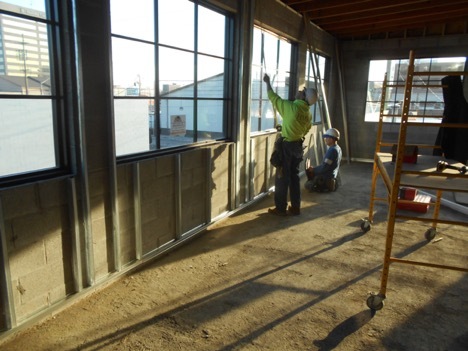 With the electric and water utilities installed, the skeletons of office walls put up, and the windows replaced, the bones of our building were complete. 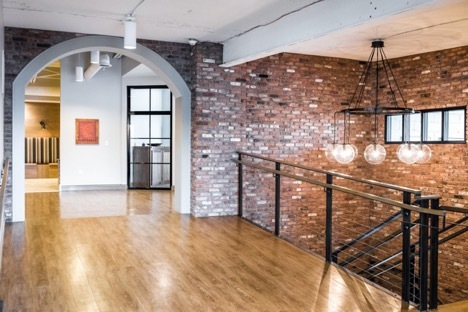 The new and improved EnviroForensics building is now a two story, 23,000 square foot office and community space with beautiful exposed brick walls, stylish edison bulb light fixtures, and plate glass room dividers. The new and improved 825 N. Capitol Building where EnviroForensics’ 75 team members come to work every day. The hallways are a celebration of Indiana artists with work from 13 Hoosier painters and photographers. 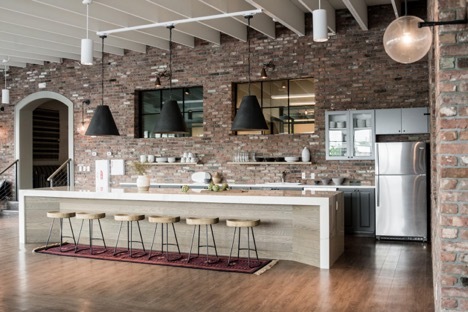 We’re proud to have six different collaborative workspaces, including three conference rooms, and two dedicated kitchen areas for EnviroForensics’ 75 team members to both work and enjoy each other’s company. The North Meridian Neighborhood was slowly on the rise before we moved to our renovated office in August of 2016. The popular Indianapolis Cultural Trail is headquartered here, the popular Indianapolis Canal Walk is available for lunch time strolls, employees can grab a drink after work at Two Deep Brewing Company, luxury apartments are right across the street, and Naptown Fitness, a crossfit gym, is within a short walk. And, coming in late 2018, there will be an added infusion of culture with the renowned Phoenix Theater moving its operations to a new 20,000 square feet, state-of-the-art facility nestled at the corner of Illinois street and the Cultural Trail. 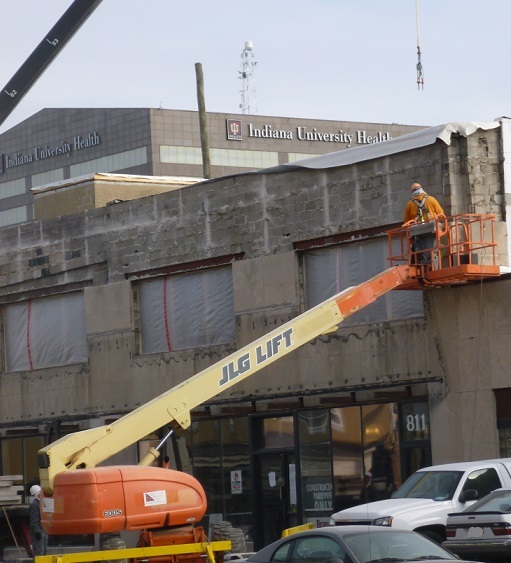 We’re excited about the future, and hope that our contribution of keeping high-paying jobs in the area helps spur the continual redevelopment of downtown Indianapolis. With over 30 years of experience, Steve Henshaw, PG has a wide range of experience in the environmental remediation field. 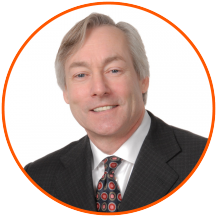 As CEO of EnviroForensics, Henshaw serves as a client and technical manager on projects associated with site characterization, remedial design, remedial implementation and operation, litigation support and insurance coverage matters. These projects have included landfills, solvent and petroleum refineries, metal plating shops, food processors, chemical manufacturers and distributors, heavy equipment manufacturers, and transporters. Henshaw’s expertise includes knowledge of industry practices and procedures, and an extensive understanding of contaminants in soil and groundwater. He has also served as a testifying expert on behalf of individual landowners and facility operators at several Brownfields sites impacted by industrial activities. Henshaw is passionate about access to clean water in developing countries and co-found a 501(c)(3) nonprofit called Water For Empowerment in 2015. The organization’s current project empowers women and girls in rural Nicaragua to create healthy futures through clean water initiatives.